Cook pasta according to box instructions. Drain and set aside. Melt butter over medium heat. Once melted add flour and stir to incorporate. Cook for 3-4 minutes until roux darkens slightly. Whisk in milk and keep cooking until thickened. Reduce heat and stir in cheeses until melted. Add in Cajun seasoning, salt & pepper, to taste. To cook shrimp, bring a pot of lightly salted water to a boil. Add shrimp and cook 1-3 minutes until shrimp are pink and opaque. Drain and rinse under cold running water. Cut shrimp into bite size chunks. 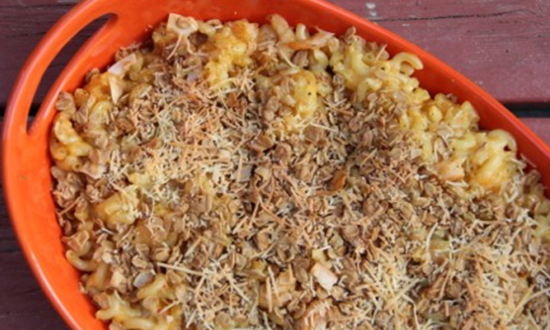 Combine shrimp, noodles and cheese sauce and place into a sprayed or buttered baking dish. Top with granola and seasonings to taste. Bake at 350°F until warmed through and topping is golden brown.